A great hang out oasis for quality Malaysian food at a decent (wow, so affordable) price. We are talking roughly around $31 for two people that covers an entrée, main and two drinks of the non-alcoholic kind. No need to make a booking. Just rock up at the Old Town Kopitiam Mamak, and customise your Malaysian dinner to the way you like it: from what type of meat to the spice level so you can have some control over the spice factor; unless you come with a friend who loves spice in anything edible. The satay chicken and beef is to die for, as well as the refreshing drinks. If you don't mind eating high quality authentic Malaysian food in a busy atmosphere (with the subway like vibe, although a relaxed dining experience) with waiters constantly moving about at a rapid pace (busier than yum cha in Sydney) and you also don't mind receiving your main meal moments after your entrée has arrived, then this restaurant is for you. The drinks are icy cool and refreshing to the touch. The iced lychee came presented in a Bavarian bier glass, with actual lychee pieces. This drink worked well, with an abundant supply of water to help get over the spice factor. Furthermore, the subway appeal is in vogue at this restaurant, yet you don't feel like your being rushed out the door. 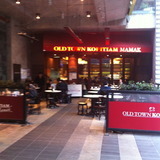 View this establishment as a longish pit stop to recharge your batteries for a great night out in the city afterwards. Buy dessert elsewhere. Great taste, great value and service, it is worth coming back for a second helping. Dont think this place exist anymore. Papa Rich has taken its spot in QV.